Heat a large sauce pan and add the oil, onions and cook, stirring until just browned about 10 minutes. Add the other vegetables and cook over the heat until lightly coloured, about 5 min. Add the garlic, garam masala, chilli powder and cook for a further 1 minute. Pour in the stock, coconut milk, chopped tomatoes, chick peas, apricots and bring up to the boil, then turn the heat down, cover and simmer until the vegetables are almost cooked about 40 minutes. Add the cooked turkey meat and cook for a further 5 minutes or until the turkey is piping hot. Turn the heat off, and just before serving add the yoghurt and coriander, serve with plain boiled basmati rice or with any of the accompaniments below. To freeze ahead: Complete the recipe up to the end of step 3. 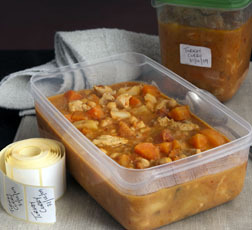 Cool, put into a freezer proof container, label and freeze for up to 3 months.To use: Thaw overnight in the fridge. Put into a large saucepan, add the turkey and bring back to the boil, complete step 4. Why not make a packed lunch for work with your leftovers.